This is a sponsored post written by me on behalf of The Glad Products Company. All opinions are 100% mine. As an adult, the end of summer means the beginning of outdoor entertaining with campfire. Jacksonville brings in a lot of military families from all over, and our neighborhood is no exception. We’re not the only northerners in our neighborhood. Some of our friends are also from up North, and something we like to do when we get together is start a fire outside in the evenings. Is there a better way to spend time outdoors with loved ones than by enjoying s’mores? 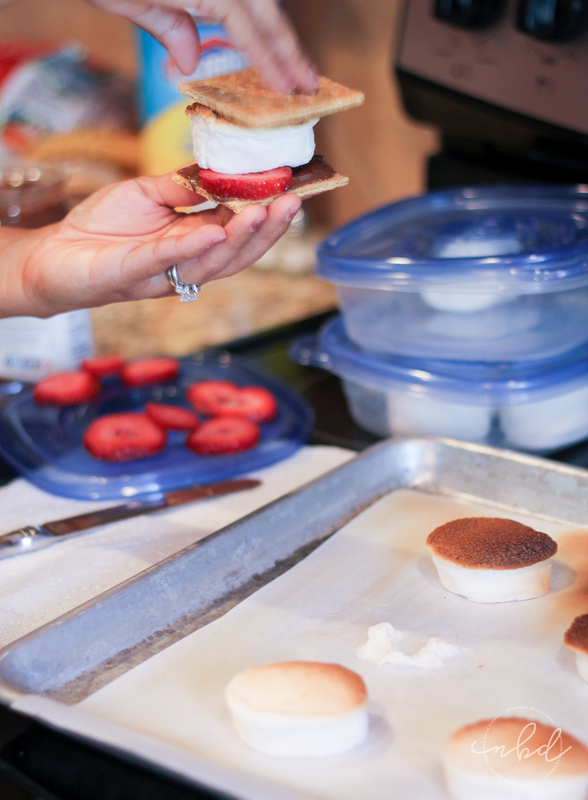 I know what you’re thinking…those aren’t your traditional s’mores. Stumbling upon a creative twist to the classic s’more that left me salivating, I knew that our family would jump at the opportunity to try a new dessert, so I assembled a s’more “station” using products by The Glad Products Company. Glad storage containers made storing and refrigerating fruits and chocolates easy, and they cut down on the dishes when we had precious few hours together. Clorox wipes helped make clean up a breeze. Laugh if you will, but Florida does actually experience a brief cold season, although it’s nowhere near as (deliciously) cold as it is up North. Unfortunately, we have to wait for colder months like October and November to enjoy a good fire. We’ve had several days of heat indexes of 100°F or higher, so I had to rethink my approach to having s’mores for family in August. If you happen to be lucky enough to live in northern states, you might be enjoying a nice fire to roast marshmallows. Me? I had to use my oven’s broiler. We could have used our outdoor gas grill, but seeing as it was 98° in the shade (with 75% humidity!) we opted to roast them indoors. It’s really quite easy! If your oven has a broiler setting, this is what you’ll be using. My oven has a normal and high setting. I opted for the normal setting. The first thing I did was get a cookie sheet and lay a sheet of parchment paper. Since I had jumbo marshmallows, I cut them in half to help the middle get gooeyier quickly. (Yes, I realize I probably made up the word). Turn your oven to the broil setting and place them on the top rack. Caution: be vigilant, as they will start to burn in no time! 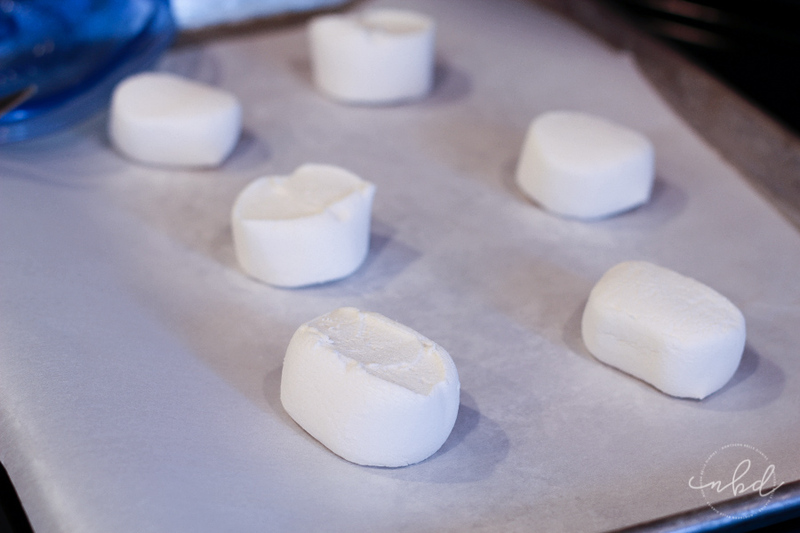 I set a stopwatch and, after pulling them out after 1 minute and 20 seconds, I had these warm delicious marshmallows to work with. Some were more browned than others, but they were all warm and soft. In hindsight, I should have rotated the cookie sheet so that they were more evenly browned. They also could have been in there a little less time overall. Next time, I’ll experiment by putting them on the bottom rack for more gooeyness. 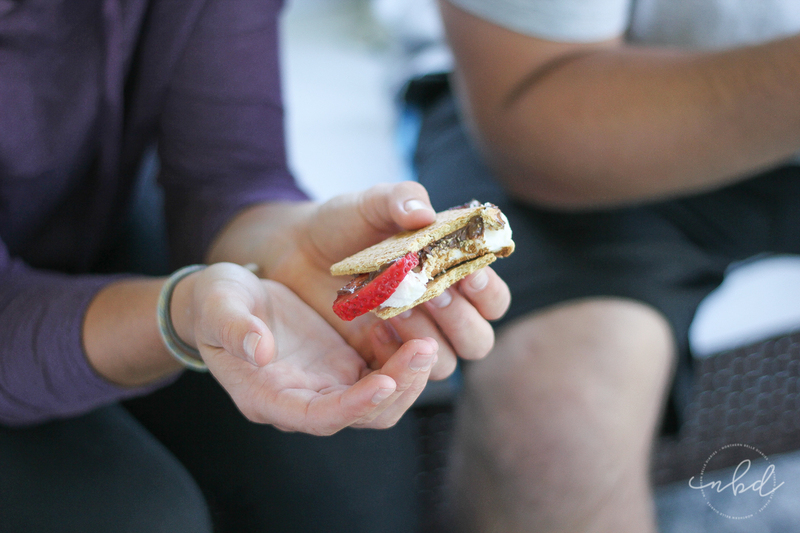 We chose to go with the strawberry and chocolate hazelnut spread s’mores. The chocolate hazelnut spread worked out well since the marshmallows weren’t browned over an open fire, and so they weren’t gushing and melting solid chocolate. We also had options for my take on the “Elvis S’more” which included a dash of honey, bananas and a peanut butter cup. My family’s favorite, however, was the strawberry + chocolate hazelnut S’more. Yum! What activities do you enjoy with family and friends?